You are here: Home » GENRE » Science » NASA’s 3D-printed Moon/Mars base plans are in. 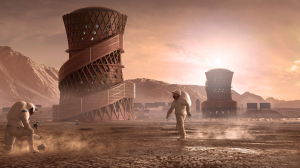 NASA’s 3D-Printed Habitat Challenge is a competition to create 3d-printed bases for the Moon, Mars and beyond using resources available off-world. April 2019 will see a $2 million prize purse go to the team best able to autonomously construct a habitat in a head-to-head habitat print run in April 2019. The challenge is managed through a partnership with NASA’s Centennial Challenges program and Bradley University. Bradley has partnered with sponsors Caterpillar, Bechtel, Brick & Mortar Ventures and the U.S. Army Corps of Engineers to administer the competition. Spiral Galaxy? It’s big… damn big! Curiosity mission as Spielberg would have done it. The ancient streams of Mars. Gravity (2013), a film review by Mark R. Leeper. « Fear the Walking Dead (season five trailer).